A push notification is a pop-up notification that appears on a computer screen in a corner or on a mobile phone screen in the list of notifications; you can close this window if necessary. It is important !!! The unscrew speed of an advertising campaign in the format of a push notification decreases if the amount on the balance sheet is less than 1000 rubles. This restriction is due to the fact that the user can click on the ad a day or more after it has been displayed. Thus, the system tries to minimize the departure of the advertiser's balance in the negative. Also for this format it is forbidden to advertise offers intended only for an adult audience. 1 Adding Push Notifications One at a Time. 2 Bulk upload push notifications. Adding Push Notifications One at a Time. Allows you to download Push Notifications one by one. To add a Push-notification in this way, you need to click on "Add Push-notification" button (image 2). Then the page for creating push notifications will open (image 3). To create push notifications, you must fill in all required fields and upload an image. The maximum word length for the "Push Notification Header" and "Text" fields is 20 characters. 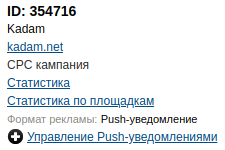 The text that will be displayed above the description of Push-notifications on the website of the webmaster. A meaningful header can significantly increase the CTR. The header can contain a maximum of 30 characters. Text to be displayed next to the push notification image. Up to 70 characters. Link to go when clicking on the push-notification. The domain specified in the settings of the campaign must match the Url Push-notification. After saving, the Push notification will be sent to moderation, in case of successful moderation and when this field is checked, the status of advertising material will be “paused” and not “active”. Here you can customize bids for specific promotional material. By default, the bids specified in the campaign settings are used. or to "Save and add more" button (image 5). If the form fields are correctly filled in, the Push notification will be saved and the form for adding a new material will open. Allows you to download all images Push notifications in one archive. To add Push-notifications in this way, you need to click on the "Bulk download" button (image 6). After pressing the button, an additional window will open for downloading the archive with images (image 7). The contents of the archive must comply with the instructions of this window. After downloading the images, the page for creating push notifications will open (image 8). This page was last modified on 23 January 2019, at 15:21.